meadow, bordered on all sides by trees and sprinkled with daisies. her, much stronger, and she was sure she couldn't take him one-on-one. "Where am I?" Katsa asked. "Forks, Washington," the young man said, his voice as cold as the weather. give away her plans to this man. "Who are you?" Katsa demanded. The man narrowed his eyes. "Edward. Who are you?" on Katsa. "Is it a tribe of werewolves?" on which way you look at it." woods, my clearing. You're not welcome here." Katsa narrowed her two-toned eyes. "That's what the other girl said." "What other girl?" Edward's voice was razor sharp. Katsa shrugged. "She was in the woods. Coming here, I assume." 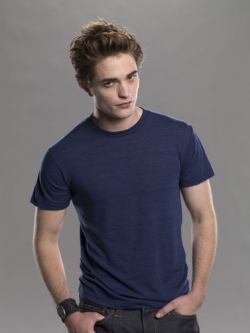 Edward's eyes narrowed and his voice grew harsh. "You didn't touch her." the man had moved across the meadow. He leaned over her, mere inches from her face. "You didn't touch her," he said. His voice was cold--as was his skin. "What are you?" Katsa asked. "Men don't move that quickly." "You know what I am," Edward said. "Say it." Katsa crouched down, ready for a kick if he struck high; a punch if he rushed her. striking distance. Katsa didn't let down her guard; she crouched, her eyes darting. "I should be able to read your mind!" Edward screamed at her. "What are you?" thinking of several things at once?" Edward concentrated. Images and thoughts flashed into his mind--Katsa kicking, punching, slicing him with a sword, countering all attacks. Her mind whizzed through every possibility; no wonder he couldn't "hear" her thoughts--she was prepared for anything. Edward stared at her cooly. "You have no idea what you're up against," he said. Katsa drew her sword, but she had not forgotten how hard the man's skin was. and fell. A sharp rock slit the skin on her palm, and Katsa shifted her grip on her sword. Edward Cullen is from Stephenie Meyer's Twilight Saga and Katsa is from Kristen Cashore's Graceling.